Since 2009, when the Obama White House succeeded in cancelling NASA’s Vision for Space Exploration, the U.S. Space Agency has lacked a defined direction concerning its crewed exploration efforts. A possible path forward for the agency, submitted earlier this summer and re-issued earlier this month (November 2016), has gained the support of two prominent space-advocacy organizations. While President Obama attempted to rectify the reaction caused as a result of his budget proposal, announced on April 15, 2010, by visiting the Kennedy Space Center in person, his plan and speech were deemed rather vague. Many in political and aerospace-policy circles wanted to see the space agency be provided with a mandate as to what it should be doing in terms of sending crews beyond Earth’s gravitational influence. Obama’s proposals to use the Orion spacecraft as a lifeboat for the International Space Station, for a trip to an asteroid, and for sending crews to Mars “sometime” in his lifetime failed to muster the majesty that President Kennedy’s Rice University speech provided. Kennedy’s speech and its core theme of “We choose to go to the Moon” had culminated in, arguably, one of humanity’s greatest accomplishments – the landing of 12 men on the surface of the Moon. Support of Obama’s space policies has not been helpful for some politicians. Congresswoman Suzanne Kosmas, whose 24th congressional district was suffering from rampant unemployment (something that appears to be ongoing according to a report appearing on USA Today in 2014) in the post-shuttle era, came out in support of President Obama’s space policies. Kosmas was defeated by former State Representative Sandy Adams on Nov. 2, 2010 – seven months after Obama’s remarks. Papers and proposals flourished in the months after the President’s speech, but thanks, in part, to their lack of affordable and the technical feasibility of these concepts, little was decided, let alone approved. 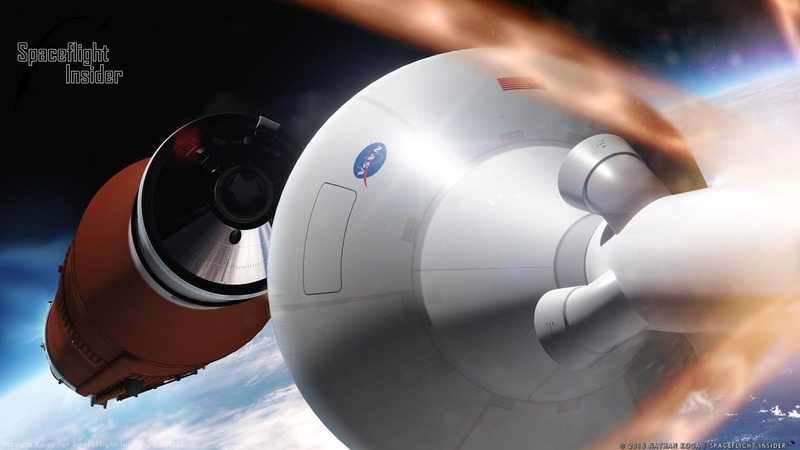 NASA settled into a two-pronged approach with private companies providing crew and cargo launch services and the agency relying on firms with decades of experience to develop the new super heavy-lift Space Launch System and Orion spacecraft for beyond-Earth orbit missions. This roadmap could possibly serve to spur the new Trump Administration to provide NASA with a coherent directive as to how it should focus its crewed exploration efforts. 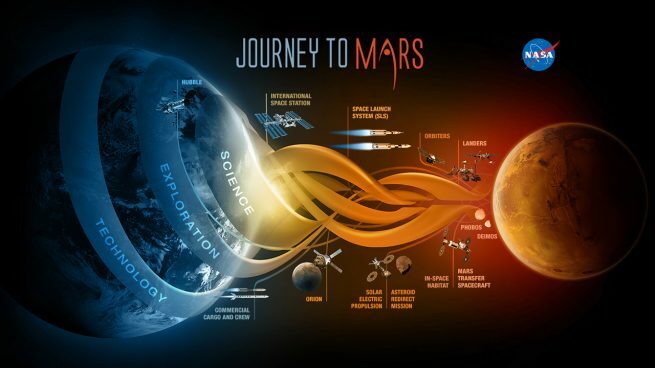 At present, NASA has been working under what has been dubbed the “Journey to Mars”. The proposal – described as a “bipartisan roadmap for the incoming Trump Administration and Congress that ensures space exploration remains a priority and supports United States’ continuing leadership in space exploration” – is titled A Space Exploration Roadmap for the Next Administration. As noted, the roadmap was drafted and issued by the Coalition for Deep Space Exploration earlier this summer, it has been re-issued and endorsed by both the AIA and as well as the Citizens for Space Exploration. 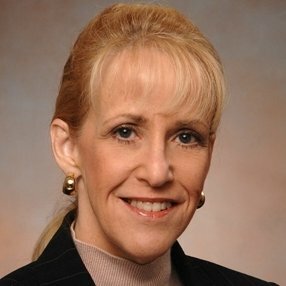 “The endorsements of the Aerospace Industries Association (AIA) and the Citizens for Space Exploration (CSE) represent the spectrum of the aerospace industry and interested members of the public and demonstrate broad support for NASA’s deep space human and science exploration programs,” said Mary Lynne Dittmar, director of the Coalition for Deep Space Exploration. Develop and maintain close alignment between the new Administration and Congress on space policy, priorities, and funding levels, building on the bipartisan consensus reflected in the 2010 NASA Authorization Act and in the annual appropriations bills adopted over the last six fiscal years. Ensure robust and dependable U.S. access to deep space missions, including the near-term uncrewed test flight of the SLS rocket and the Orion spacecraft in 2018, and a 2021 test flight with a crew that will enable American astronauts to lead the way into deep space. Advance U.S. leadership and achievement in space science with the 2018 launch of the James Webb Space Telescope and the Insight mission to Mars, funding for upcoming Mars and Europa planetary missions, and ongoing investment in missions across NASA’s science portfolio. Ensure use of the International Space Station as a technology test bed and cornerstone of NASA’s comprehensive plan for future deep space exploration. Focus new transportation services on supporting NASA’s low-Earth orbit activities and missions without sacrificing safety and mission assurance. Strengthen NASA’s effectiveness by streamlining its institutional footprint, bureaucracy, and procurement practices to ensure effective deployment of existing resources. Ensure development of new technologies and space capabilities which directly support science, exploration, and national security needs. “Together with the Coalition these associations endorse NASA’s role in maintaining U.S. leadership in exploration, science and commerce in space. The consensus across industry and the scientific community is to complete and operate important national assets such as the Space Launch System (SLS), Orion crew vehicle, Ground Systems, and the James Webb Space Telescope (JWST),” Dittmar added. The Roadmap was released in June to both candidates and shared on Capitol Hill and with the public. It was re-released after the election as a reminder to the incoming administration and other stakeholders. The Coalition for Deep Space Exploration’s presidential transition policy paper appears to be quickly gaining more support within the industry. As Trump assembles his NASA transition team who will be responsible for assessing the agency’s programs, the Coalition thought that this would be of interest to the readers of SpaceFlight Insider to further understand the Coalition’s recommendations to ensure U.S. leadership for space exploration and science. For their part, the Coalition for Deep Space Exploration has expressed excitement about the possibilities of what a revived NASA could accomplish. “NASA is currently on a trajectory to open up the Solar System using the Orion crew vehicle the Space Launch System, enabling human beings to travel further from Earth than ever before. At the same time, NASA’s ‘vision’ is about to be extended by the James Webb Space Telescope, which will peer back in time toward the Big Bang. Meanwhile, NASA is in the process of handing over logistics and eventually facilities in low-Earth orbit to private industry, as it lays out its next steps toward the Moon and eventually Mars with industry and international partners,” Dittmar told SpaceFlight Insider. At present, despite there being some basic statements that President-elect Trump will support NASA’s current crewed initiatives, little has been released about how the newly-minted leader of the free world will treat the space agency (outside of his lack of support for NASA’s Earth sciences programs). NASA is currently working to conduct the first test flight of its new super heavy-lift Space Launch System rocket at the close of 2018. This is the same year that private firms working on NASA’s Commercial Crew Program hope to conduct the maiden flights of their crew-rated spacecraft to LEO. This article was updated on Nov. 29, 2016, at 21:40 p.m. EDT to reflect the fact that the Roadmap was initially released this summer and re-issued in November of 2016. This is the standard,unaffordable industry pork protection plan. Instead, NASA should: 1) cancel SLS and Orion 2) transition the Space Station to private management by 2024 2) use the savings to provide an anchor government customer, technical assistance and policy support for commercial deep space crewed exploration and settlement of the Moon, Mars and beyond (e.g.,Red Dragon, Falcon 9 Heavy and the ICT). So, instead of sending money to 2 aerospace firms with over a half century worth of experience, we should send all of that money to one company with no experience in crewed exploration whatsoever? Sorry, Not meaning to be rude, but that’s just stupid (not to mention selfish and hypocrtical). You get what you pay for, that includes sending the CRS-7 payload to the bottom of the Atlantic or the Amos-6 to its funeral pyre. I know you NewSpace types don’t understand this, but without experience, you don’t get the big contracts. Figure out how to keep the Fiasco 9’s 2nd stage from blowing up and launch a single person to LEO – then come back with that noise. Until then? Sit down and be quiet. Sorry, but I think the astronauts and their families would appreciate not having their loved ones perish in the next Fiasco 9 catastrophe. By the way, what happened to returning the Fiasco 9 to service by November, or the end of the year? You don’t get to be so arrogant after having 2 missions end in disaster in just 14 months. Thank God there weren’t any crews on board. The CSE’s Roadmap fails to adequately address crewed lunar return. This is a policy blind spot which will not go away via neglect. Our international partners and competitors are waiting to see if the US has a clear answer and missions to lunar orbit are not adequate. If the US leaves the establishment of humanity’s first permanent foothold off Earth (i.e. on the Moon) to our strategic competitors then we will lose our lead in space. The Roadmap is the status quo which contains a collection of the most expensive approaches making it vulnerable and unsustainable. Rather, there needs to be reconsideration of the approaches to both crewed lunar return and the Journey to Mars in which both use cost-effective strategies. LunarCOTS.com describes a very low-cost method of crewed lunar return and there needs to be a cost-effective plan for sending crew to Mars. One way would be to reduce the cost of transporting cargo by launching on much lower cost commercial vehicles to LEO followed by solar electric propulsion to an EML staging point and to low Mars orbit. Other strategies are possible. What needs to be addressed is the type of contracts issued to aerospace engineering firms. Robert Zubrin has stated that the biggest product Lockheed-Martin and Boeing have to sell is overhead on their “cost-plus” contracts, and that most of the money spent is towards mid-level management and internal accounting services, not hardware production. I’m in favor of a closer working relationship between NASA and all the contractors to ensure minimal duplication of effort, and a focus on an achievable goal. A fully support completion of the James Webb Space Telescope, but have come to the realization that the ISS is almost a black hole for funds. Privitization of that asset should become a priority, through leasing of onboard laboratory space to private research firms. Continue the utilization of the facility, but not at additional taxpayer expense. As far as deep space goals, I strongly believe we should accelerate all efforts toward Mars landings. I have very mixed feelings about the SLS and Orion capsules, though. It seems to be a piece of hardware sans mission. I’m also a proponent of funding a very aggressive mission/set of missions to Europa in the Jovian system, including a lander with a suite of life seeking instruments. All the deep space probes to date have utilized only RTGs for power provision; NASA should undertake building a deep space capable nuclear generation powerplant — perhaps Thorium based–in order to increase the data return rate from these very expensive probes? Get NASA out of the Global Warming business! We should have our premier agency facing OUTWARD, not contemplation the Earth’s navel. These people clearly have an agenda – a financial one. One wonders how much of this is actually SpaceX lobbying in disguise. Moreover, the CSE, as an organization, is not qualified, nor desired, to be the taxpayer’s representative in directing public monies – for anything. This article was clearly penned by someone “on the payroll” of the old-line major aerospace companies, thereby with an agenda. It’s an undeniable fact that the NewSpace companies have impacted the industry–in my view favorably–by lowering launch costs through innovation and reusability. Their success rate is no worse than the earlier days of Lockheed, General Dynamics, and Douglas back in the ’60s. As these new firms gain additional experience, their track record of launch failures will either diminish or the companies will cease to exist. Adaption of new structural materials is always fraught with “anomalies,” to use the phrase so carefully crafted by SpaceX. I fully support the NewSpace efforts to enable lower cost access to LEO and beyond. That said, this will in turn, force Lockheed-Martin and Boeing to undergo some self-examination and changes to internal operations regarding type of contract in which they engage. Cost plus is a gigantic open sewer of funds entering massive corporate black holes. Pay for performance ala SpaceX, who charge $65 Million for a Falcon 9 launch–which is always payload insured. Before crewed Falcon 9s launch, there will be at least 2 test flights in order to prove the concept, along with another dozen or so satellite launches. The crewed missions with manned capsules being fueled just prior to launch is just a new way of doing things–all the ComSat launches are done this way, and only one incident has occurred in 30 launch attempts and a lot more Hot Fire tests. A correction to my above rant: Replace Lockheed with Martin, and Martin-Marietta. THIS SITE NEEDS AN “EDIT” CAPABILITY! That’s one of the things we’re working on. However, we’d recommend not going on “rants” in the first place and to think about what you say before you click enter. It’s more in needing editing capability in order to make minor detail changes, correct spelling errors, grammar, etc. I used the term rant in something of a tongue in cheek manner. It was very seriously thought out.